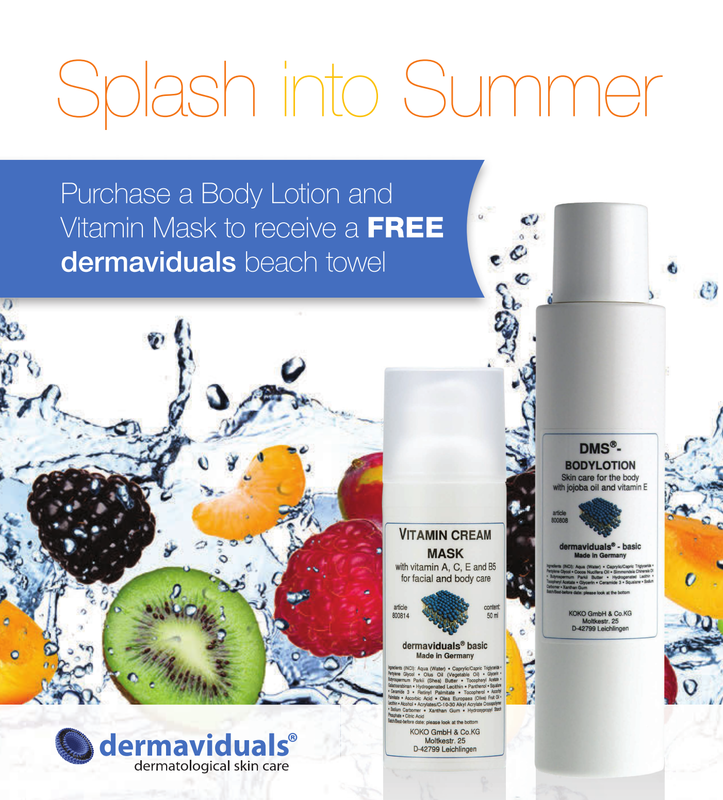 Home | Latest News | Splash into Summer with dermaviduals! Summer is just around the corner and while the thought of exposing skin that hasn’t seen the light of day in awhile may seem daunting, never fear; dermaviduals has your back. We will have your skin beach and Summer ready in no time! First things first. Let’s get your body hydrated. Our DMS Body Lotion is a year-round essential, but it certainly proves its worth in the warmer seasons when you have to bare (nearly) all! Not only does the Body Lotion provide the skin with our famous Derma Membrane Structure but also Vitamin E, Olive Oil and Shea Butter. Apply over the entire body and watch the effects last for up to 72 hours. Free from emulsifiers, there is no wash-out effect when you shower, hence its ability to increase hydration and the regeneration of the skins cells. With the inclusion of Vitamin E, it is nourishing and provides elasticity. Our DMS Body Lotion is particularly good if you are pregnant or prone to stretch marks. Next, we turn to our Vitamin Masks for an antioxidant boost. Both our Vitamin Cream Mask and Mask with Vitamins contain the same concentration of active ingredients but they are different in consistency. The Vitamin Cream Mask has a thicker, creamier texture due to the higher amounts of Shea Butter and oils, giving comfort and nourishment to the skin. Whereas the Mask with Vitamins has a lighter more fluid texture, often preferable for Summer or younger skins. Both products are excellent for long term barrier maintenance and deliver effective results. As well as enhancing barrier protection and skin nutrition, both Vitamin Masks improve hydration, uneven skin tone and loss of elasticity, minimising the signs of ageing. Simply apply and forget it is there! The leave-on masks are the perfect accompaniment to a busy schedule so you don’t have to forgo your skincare regime. We all know how important sun protection is, so make sure you don’t forget to slip, slip, slap this Summer. Exposure to UVA and UVB both contribute to premature skin ageing, sunburn, melanoma and other skin cancers. UVA penetrates deeply into the dermis causing genetic damage to cells, photo-ageing (wrinkles, blotchiness) and immune-suppression. UVB penetrates into the epidermis causing damage to the cells. UVB is responsible for sunburn – a significant risk factor for skin cancer, especially melanoma. Did you know that sunscreen needs to be replaced annually? Make sure your sunscreen is doing its job by buying fresh at the start of the season. SPF 15 already protects against 93.3 % of the UVB radiation. SPF 30 provides 96.7 % UVB protection. dermaviduals broad spectrum sun protection also protects against damaging UVA radiation. Because SPF 15 absorbs already 93.3% of the damaging UVB radiation you can stay in the sun 15 times longer than if you are without any protection, before getting burned. Perfect if you are exposed to sun for short periods of time or if you work indoors most of the day. Increase the level of protection by application of an SPF certified mineral make up. SPF 30 should be applied for wind, snow and water reflection activities, whereas correct application of SPF 15 provides excellent general daily protection. Apply your sun cream daily after your prescribed dermaviduals moisturiser in the morning. If exposed directly to the sun for prolonged periods, please remember to reapply your sun cream frequently. To increase the protection against skin damage it is vitally important to include antioxidants (Vitamin Mask, anyone?!). To celebrate the warmer weather, we are giving away a FREE dermaviduals beach towel with the purchase of a Body Lotion & Vitamin Mask in one transaction.